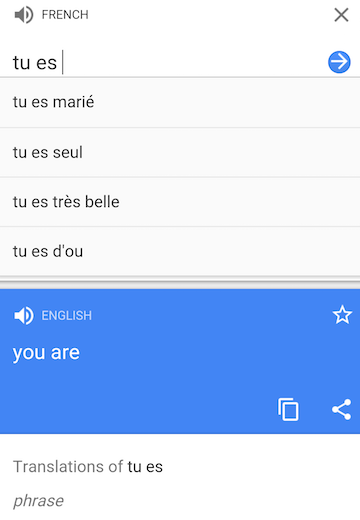 Google Translate's site for desktop and mobile now shows suggestions and autocompletes your text, much like Google Search. This works for English, French, Italian, Spanish, German, Portuguese, but you have to manually pick the input language instead of relying on automatic detection. The new feature helps you translate faster common phrases, words and expressions, but it's not very useful for long texts. For example, I picked French as the input language, typed "k" and one of the suggestions was "kinésithérapeute", which means "physiotherapist". 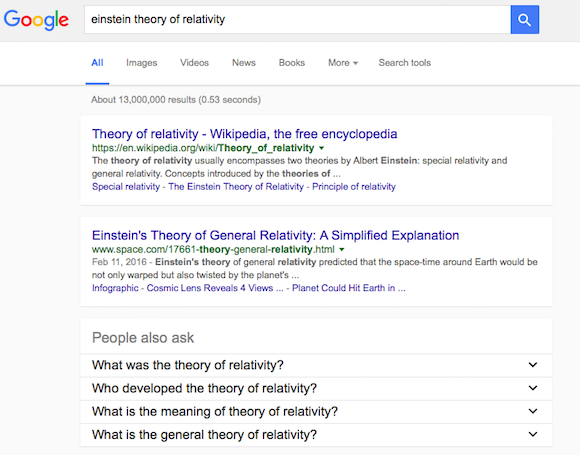 Sometimes Google's Knowledge Graph cards use more real estate than all the other search results combined. 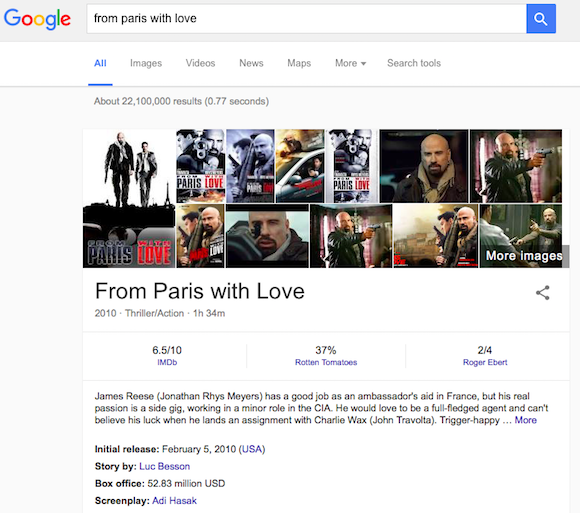 I've searched for [from Paris with love] in the experimental mobile-like desktop interface and got a huge card with images, information about the movie, ratings, cast. 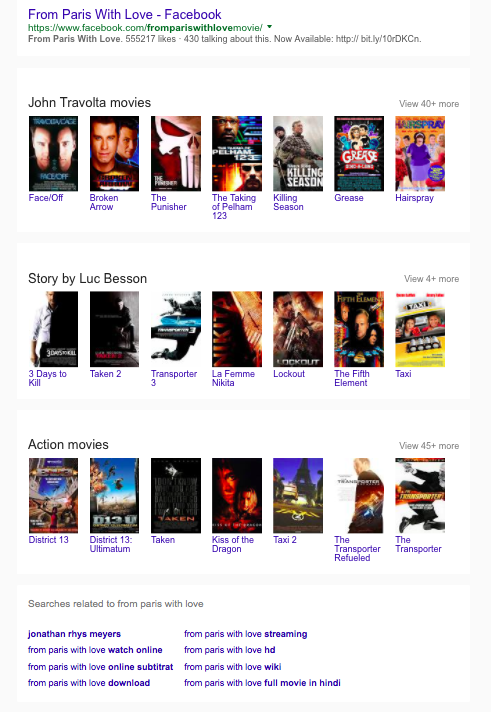 Then Google displayed 10 search results and 3 other cards with John Travolta movies, Luc Besson movies and action movies, followed by another list of related searches. 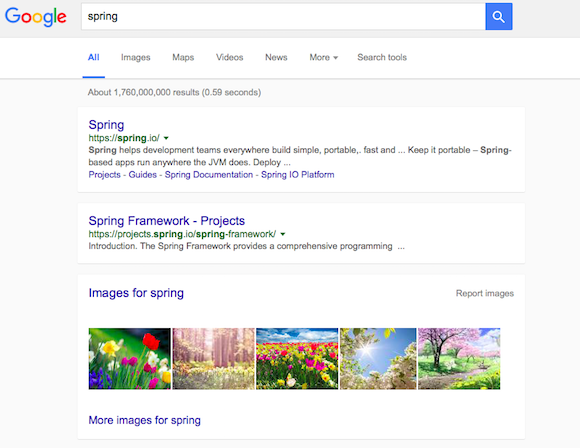 Google experiments with a desktop search UI that looks more like the mobile interface. The experiment uses the same white cards on a gray background for both search results and ads. When the card-style layout was launched for the mobile site back in 2013, Google mentioned that the new look was "cleaner and simpler, optimized for touch, with results clustered on cards so you can focus on the answers you're looking for". When you open google.com in Firefox, Safari or any other browser than Chrome, you'll sometimes see an ad for Chrome. 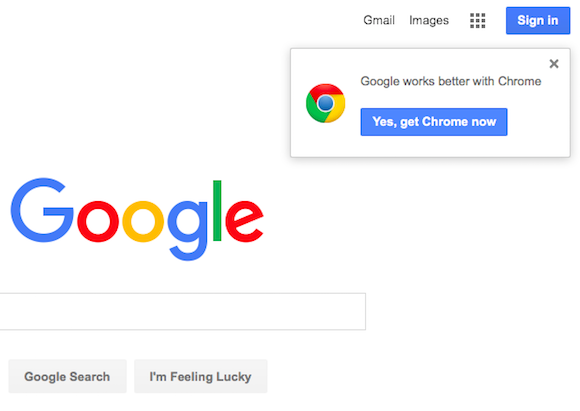 Usually, Google's promotional messages suggested you should try Chrome because it's fast, but now Google has a new ad: "Google works better with Chrome". Clicking "Yes, get Chrome now" sends you to the regular Chrome homepage, which promotes Chrome as "one browser for your laptop, phone and tablet" since "Chrome brings your open tabs, bookmarks and recent searches from your computer to your phone or tablet, and vice versa". Chrome has many features that integrate Google services (translation, spell checking, reverse image search, Safe Browsing, Cloud Print) and many Google features only work in Chrome (voice search, offline Google Drive, Google Play Music uploading). Maybe Google should link to a page that explains why "Google works better with Chrome", since it's not exactly obvious. A Twitter user says that "if you can't get a 1 field 2 button form & list of results working cross-browser, you're doing it wrong", while another one finds that "'@google works better with Chrome' sounds like a bug report. Can you just fix it please?". F. Nonnenmacher thinks that "Microsoft was sued for less than that". Back when the desktop was king, Google used to be all about the Web and the browser. As mobile devices got more popular, browsers were no longer the most important application for many users. Specialized apps for music, video, photos, messaging, maps were much more popular because they were better suited for mobile. Google pushed the boundaries of the mobile web with Chrome, but a few years ago it started to move on. New services like Inbox no longer have mobile web apps, Google Play Music no longer works from a mobile browser, the Google Docs mobile app no longer lets you edit documents etc. Google started to index mobile apps and link to the apps directly from Google Search. 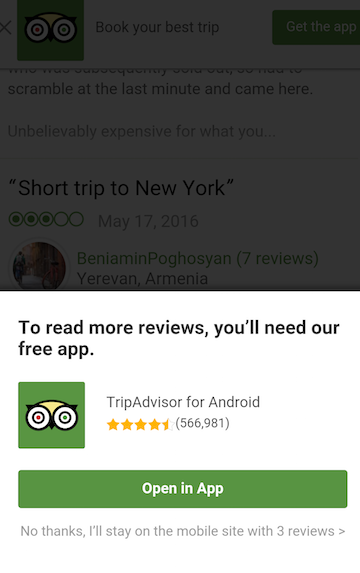 More and more sites push users to install their mobile apps, some of them display limited content and force users to install the apps to read the entire content (example: TripAdvisor). Now Google announces a new Android feature that will make apps even more powerful. Android Instant Apps will let you launch apps without even installing them: your device will only download the required modules for displaying the content. "With Instant Apps, a tap on a URL can open right in an Android app, even if the user doesn't have that app installed. As a developer, you won't need to build a new, separate app. (...) You modularize your app, and Google Play downloads only the parts that are needed, on the fly. And when you do upgrade, your app will be available to more than a billion users on Android devices going back to Jelly Bean," informs Google. Right now, Google works with a small number of developers from BuzzFeed, B&H Photo, Medium, Hotel Tonight, Zumper and Disney to refine the experience. Instant Apps will be available later this year as part of a Google Play Services update. Instant Apps will be limited to the content you want to display (a Medium article, a B&H camera), but you'll be able to install the full app if you like. It's like launching a personalized trial version of the app. While the new feature is impressive and has many potential uses, I think it will make the mobile web even less important. If Apple launches a similar feature, developers will start to close their mobile sites and the mobile web will disappear. That's quite dangerous, since it will limit the mobile OS choice to Android and iOS. It's much easier to create a site than an app and many apps are completely unnecessary, not to mention that web apps use open standards, while mobile apps use proprietary APIs and have to rely on closed app stores. The open web ecosystem made Google what it is today. Hangouts was supposed to be Google's unified messaging solution, but things didn't go as planned: Hangouts was buggy, lacked features and many people hated it. After releasing a separate app for SMS (Messenger), Google will soon launch 2 other apps: Allo for group chat and Duo for video calling. Both Allo and Duo use your phone number, much like WhatsApp, so you can chat or talk with anyone from your phonebook. 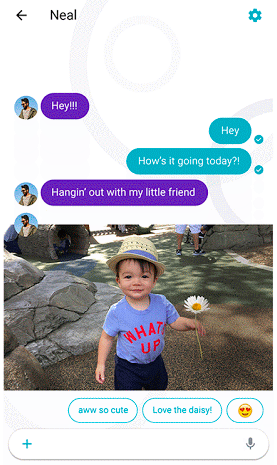 Allo includes a special version of the Smart Reply feature from Google Inbox and it suggests replies for both text messages and photos. Smart Reply learns over time and adapts to your style, suggesting replies you are likely to send. 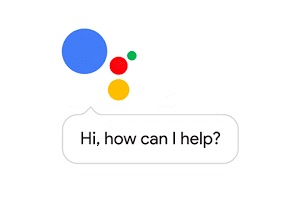 There's also a Google Assistant you can add to a conversation to answer quick questions, show search results and even perform actions like reserving a table at a restaurant. "The Google assistant in Allo understands your world, so you can ask for things like your agenda for the day, details of your flight and hotel, or photos from your last trip. 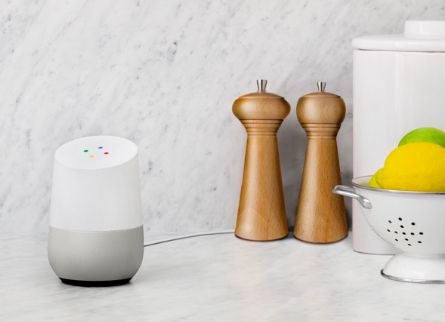 And since it understands natural language patterns, you can just chat like yourself and it'll understand what you're saying," informs Google. Allo lets you share photos, add text to photos, add emojis and stickers. 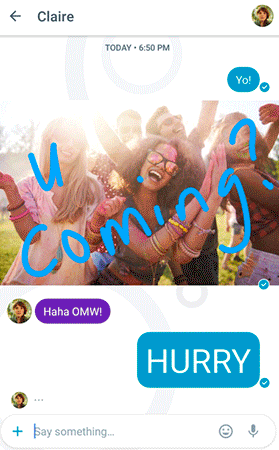 There's also a Whisper Shout feature that lets you resize the text before sending it. Allo has an incognito mode for private conversations. The incognito mode features end-to-end encryption and discreet notifications. Much like in Chrome, you'll need to manually start an incognito conversation and some features aren't available in incognito mode. Duo is a simplified one-to-one video calling app that uses your phone number, works well on slow Internet connections (it uses WebRTC) and has a Knock Knock feature that shows a live preview of the caller before you answer. Hopefully, users will be able to block those who abuse this feature. 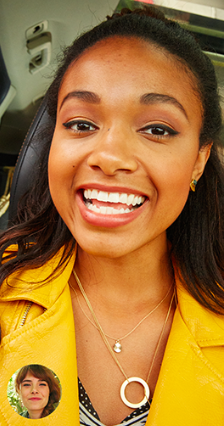 "Duo calls are in crisp HD video (up to 720p) and audio. We've optimized Duo to work well even on spotty networks, so if bandwidth is limited it gracefully adjusts quality so you're still able to connect. We also seamlessly transition calls between cellular and Wi-Fi, so you don't need to worry about what network you're on. Finally, we built Duo with privacy and security in mind and all calls on Duo are end-to-end encrypted," explains Google. Allo and Duo will launch this summer and will be available for Android and iOS. For now, Hangouts will continue to exist, since Allo and Duo lack many of the features from Hangouts. Google doesn't have a good track record when it comes to messaging services, so it's hard to tell whether the new apps will be successful. It looks like Allo and Duo will be simple, fast and more focused. 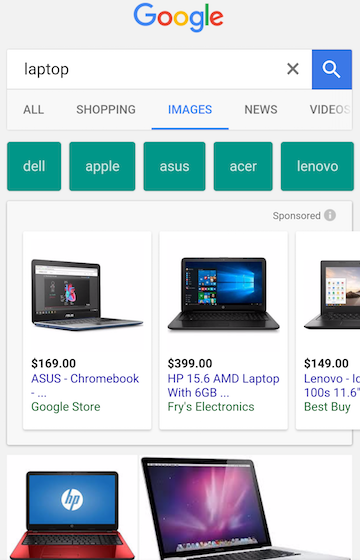 Google's product listing ads are now available in mobile Google Image Search. They're placed above the list of image search results and look much like the shopping ads from web search. Google also shows a colorful list of related keywords you can add to your query: brands, colors, categories and more. "Whether they're looking for a new sofa or the perfect pair of earrings, people who search and shop on their smartphones at least once a week say that product images are the shopping feature they turn to most. And it turns out, the top questions Google Images users ask us are 'What's the price of this?’ and ‘Where can I buy it?'. 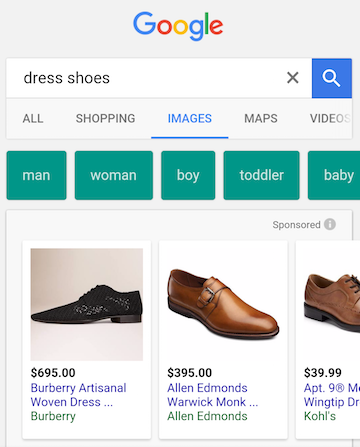 That's why we are introducing Shopping ads on image search," informs Google. Here's the "shop on Google" section from web search. 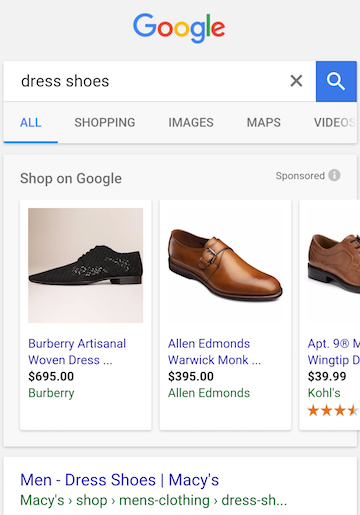 Google's image search engine now shows rich snippets for shopping sites like Amazon and eBay, but only when you use the mobile interface. 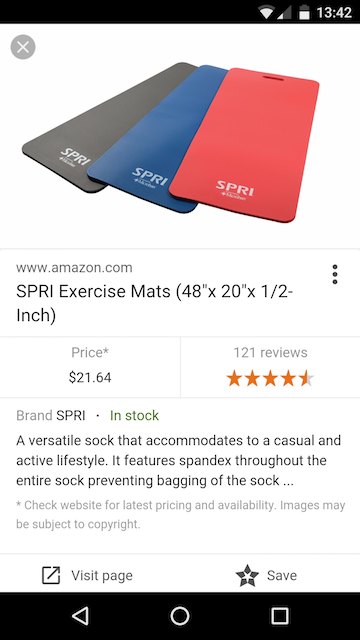 Google displays the name of the product, the price, the rating and the number of reviews, stock information and a short description. There's also a message that asks users to "check website for latest pricing and availability". Google Image Search is pretty useful for finding products and the new snippets include even more information. I'd like to see a filtering option for products in web search and image search, now that Google Product Search only shows paid listings (also known as ads) and "payment is one of several factors used to rank these results". If you search for a word in a foreign language, Google now automatically shows the translation. 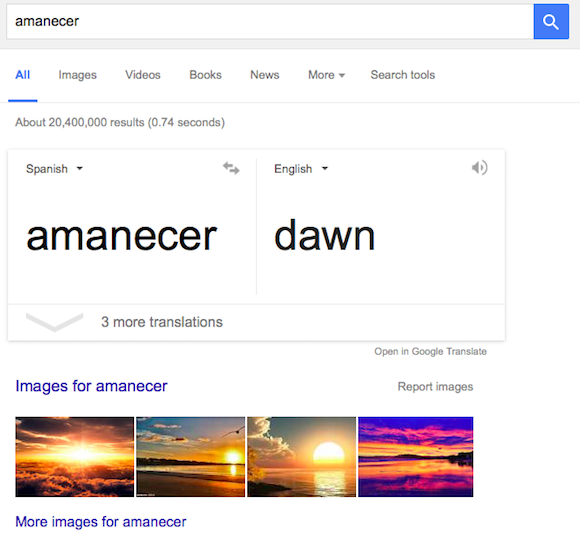 For example, you can search for [amanecer] to get the English translation of the Spanish word, instead of typing [translate amanecer] or [translate amanecer to english]. This only works for words, and some expressions, not for longer texts. It works for [buenas noches], but not for [buenas noches señora], so you'll still have to search for [translate buenas noches señora] or [buenas noches señora to english].